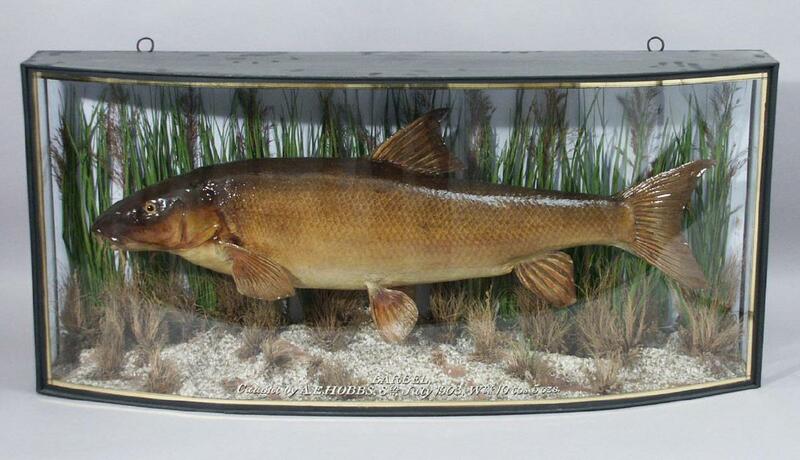 Preserved and cased Barbel fish, caught by AE Hobbs in the River Thames on the 8th July 1903. Weight 10 lbs 5oz. Colour - Barbel vary in colour, it is usually greyish brown on the back with greenish golden sides (flanks) and a creamy white belly. The fins are grey and the lower fins often have a pink tint. Size - It grows up to 90cm (3ft) long. Charcteristics - The barbel is a powerful fish with a long body and a pointed snout (nose) with four barbels. The fish uses its barbels to search by taste for food. There are two small barbels by the tip of the nose and 2 longer ones near the back of the mounth. The barbel is also a member of the carp family. Diet - It feeds on the bottom of the river and usually at night. It eats insect larvae, molluscs, crustaceans and worms. It also eats small fish and plants. How fished for - Anglers use either float or ledgering (when a lead weight is used to keep the bait near the bottom of the water) tackle. Dead minnow is known as a good bait when fishing for barbel. Interesting facts - Barbel fishing was a very popular pursuit with Victorian ladies. They are native to the River Thames and have lived here since the last ice age.